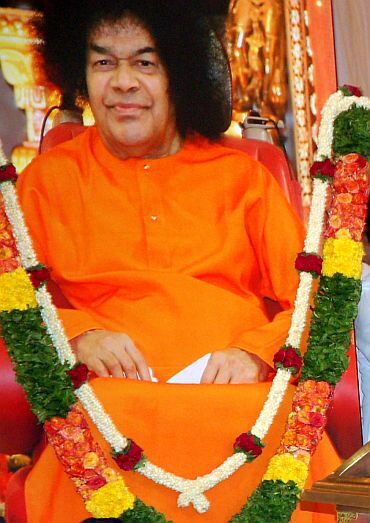 A large number of devotees continued to pour in through the night to get a last glimpse of Sathya Sai Baba who passed away due to cardio respiratory failure on Sunday morning. The number of devotees arriving in Puttaparthi is expected to touch 5 lakh by Tuesday and arrangements are being made to ensure that the funeral passes off peacefully . The samadhi arrangements for Sathya Sai Baba have already begun. 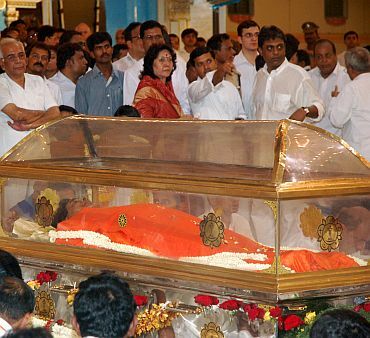 He will be buried at the Sai Kulwant hall on the same dais from where he used to give darshan to his devotees. It remains unclear whether devotees will be allowed into the Sai Kulwant hall on Wednesday morning. A host of VVIPs, including cricketer Sachin Tendulkar, who played a game at Hyderabad on Sunday and who is a devotee of Sathya Sai Baba, visited Puttaparthi on Monday. Prime Minister Manmohan Singh and Congress President Sonia Gandhi will visit Puttaparthi on Tuesday. Dr Singh was scheduled to pay his respects to the spiritual leader on Wednesday, but his travel plan had to be rescheduled due to security reasons. Meanwhile, the devotees who were extremely angry with the members of the trust for withholding information on Sathya Sai Baba's health, have now made their peace with the passing of the spiritual leader. They now say that it was Baba's wish to stay on at the hospital for this long so that his devotees would not be shocked at the news. 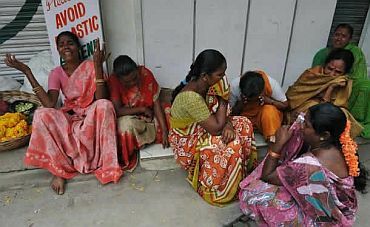 Puttaparthi, the small town in the Ananthpur district of Andhra Pradesh, woke up to a very different morning on Monday. Normally, there is peace in this town with devotees, shopkeepers and others going about their business. They always greeted each other by saying Sai Ram and there was a sense of serenity amidst the people. However, Monday morning was a bit different, as they have woke up to realise that their God had left his body. Although they believe that his soul is very much present amongst them, things surely appear a bit different. The mourning and the sorrow continues to fill the air. Some devotees say that a lot would depend on the manner in which the trust manages the affairs in future. Baba was the connection between Puttaparthi and the rest of the world. The trust would have to ensure that there are no contreversies and will have to run the affairs as Baba did when he was its chairman. However, things are not likely to be the same. Devotees say that Baba had a great deal of confidence. They quote two incidents in Puttaparthi to substantiate their belief. A Hanuman statue, erected in Puttaparthi, took a long time to complete. The problem was that the statue was unable to bear the weight of the mountain in Hauman's hand. It was only when Baba stepped in that the problem was solved. He just told the men working on the statue to let the cloth around Hanuman's neck fall on his thigh so that it would act as a support. The other incident was when the members of the trust told Baba that they needed to increase the price of the meals in Puttaparthi from Rs 6 to Rs 10, as they were incurring a loss. Baba snapped saying, "Don't irritate me. If this is your attitude then I shall serve the meal free of cost." The price did not change and the trust did not incur any loss in future. Most devotees that rediff.com spoke with say that they will continue visiting Puttaparthi and there will be no change in their schedules. Yes, it will not be the same since we will not get to see Baba in his living form. However, we can always feel his presence over here; his soul is very much with all of us. 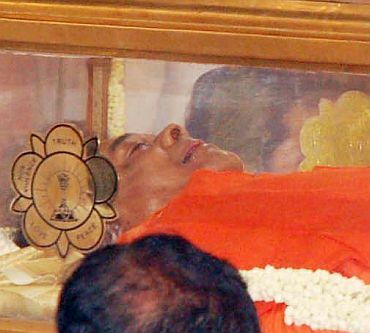 After Baba, who will run the Rs 40,000 cr Sathya Sai Trust?